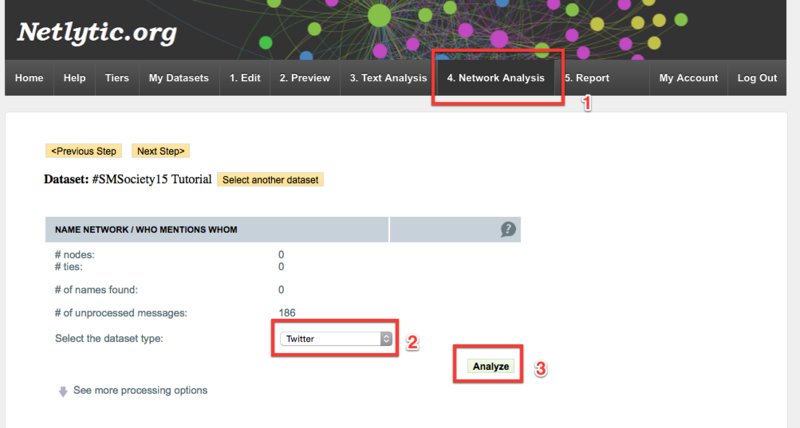 Step 2: Go to https://twitter.com/search-advanced and create a test search query. For today’s tutorial, type “#SMSociety15,” into the “Any of these words” field and select “English” from the “Written in” drop down menu. 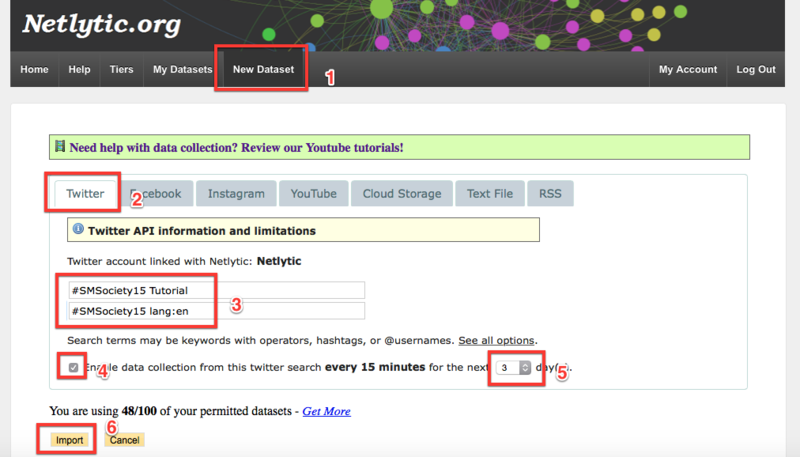 Step 3: Once you are satisfied with the search results, go back to Netlytic, select the Twitter option under the “New Dataset” menu, copy & paste the search query from Step 2 (“#SMSociety15 lang:en”) into the second text box (Twitter Search Terms), give any name to this dataset (for example, “#SMSociety15 Tutorial” and click the “Import” button. 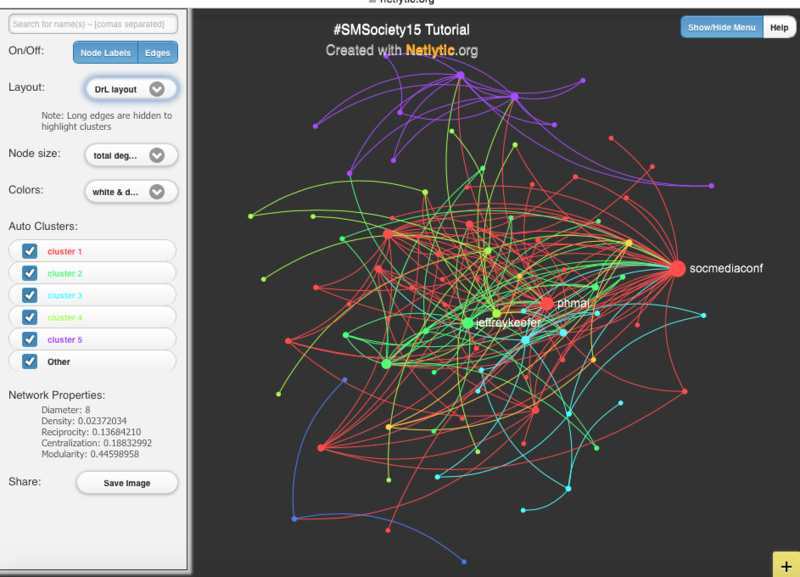 Note: If you downloaded the “#SMSociety15” dataset from the link provided in Step 1, then use the “Text file” tab instead of “Twitter” to import your data into Netlytic. 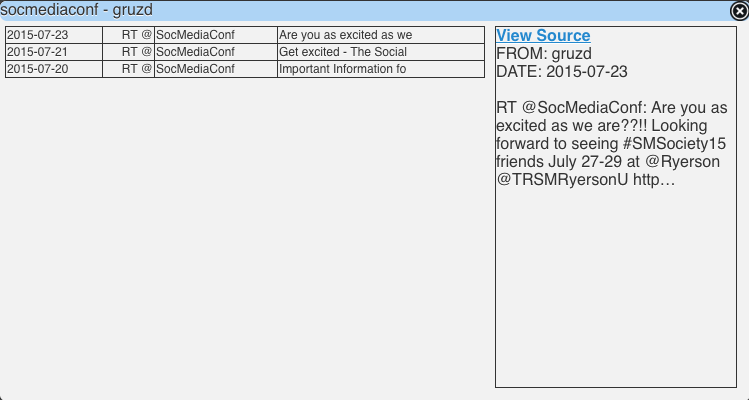 The Import command will retrieve 1000 most recent tweets from Twitter that correspond to your search query. 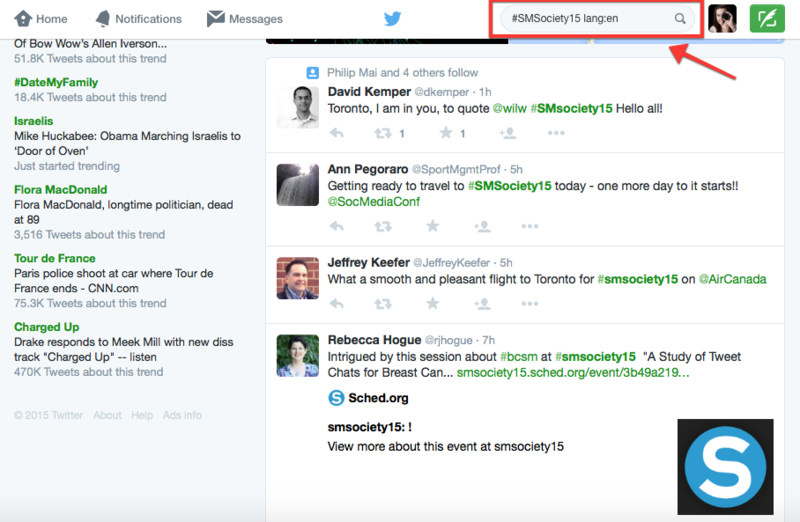 In our case, it is going to be any Twitter message that mentions the ”#smsociety15” hashtag and is written in English. 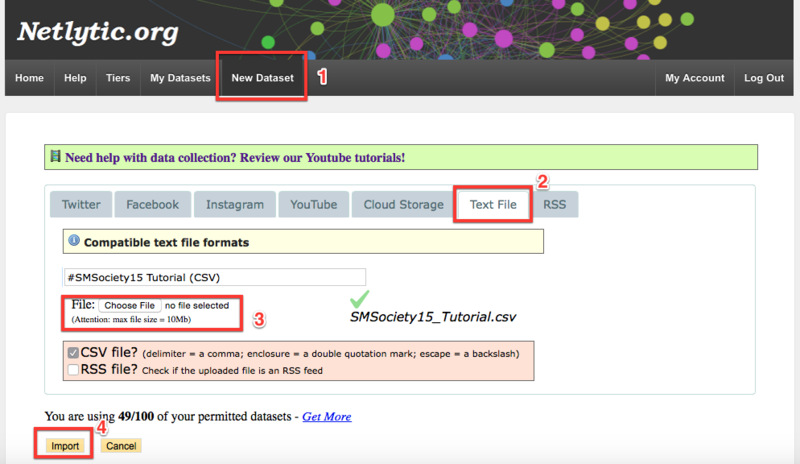 Step 4: Click “Next Step” to preview your dataset. This step is designed to confirm that your dataset was imported properly. Step 5: Go to the “4. 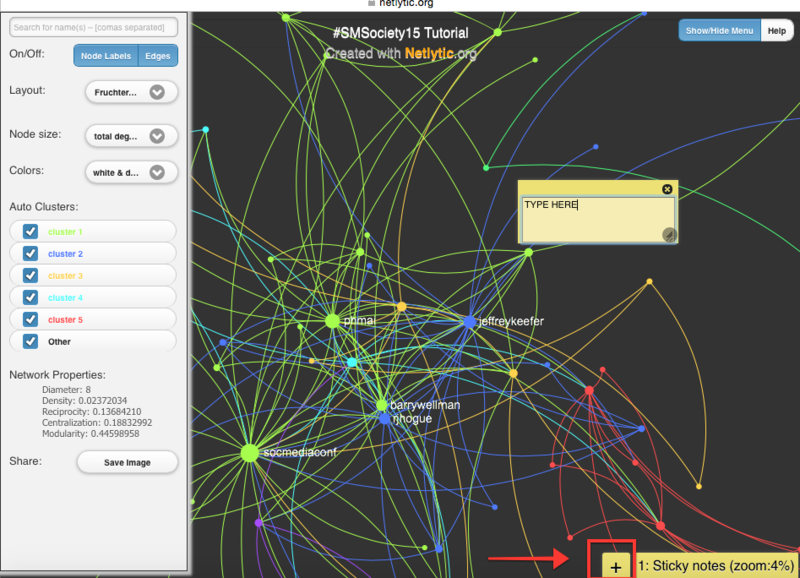 Network Analysis” menu, find the “Name Network” section and click the “Analyze” button. 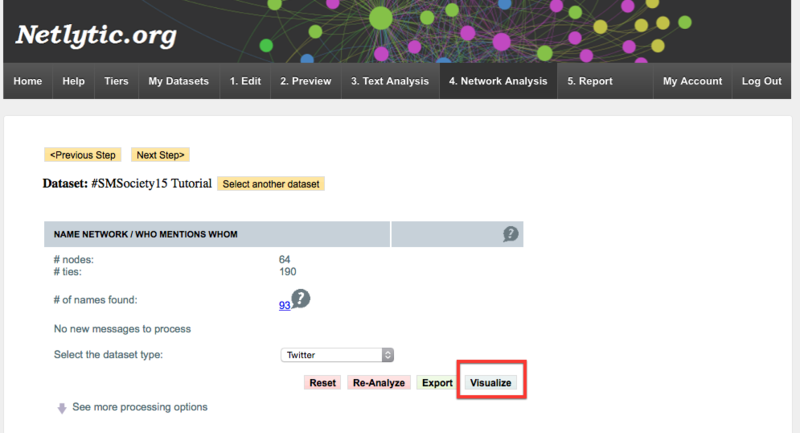 Note: If you uploaded your dataset to Netlytic and did not import it directly from Twitter, select the dataset type as “Twitter” from the drop down menu before clicking on the Analyze button. Step 6: Once the network is built, click on the “Visualize” button. 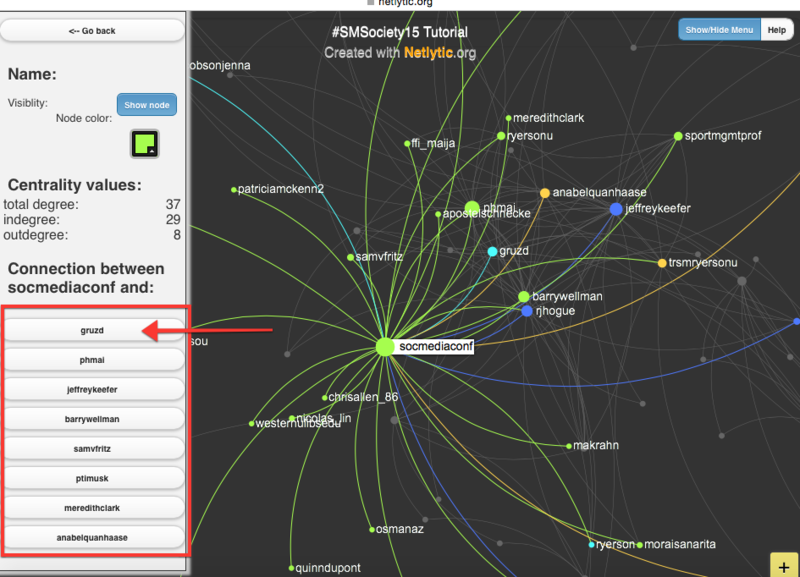 The pop-up window will display the discovered network that represents “who mentions/replies/retweets whom”. 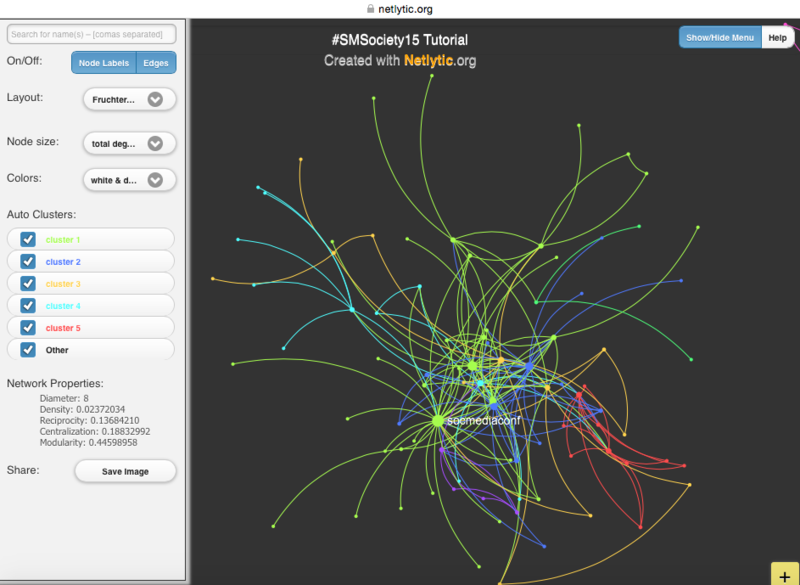 Step 7: Review some of the most connected members in the network, as indicated by the larger node size, and then read some of the messages exchanged among them and other Twitter users to understand the formation of connections in this network. Step 8: Using the Notes feature (see below), annotate 3-5 different clusters/areas in the network that are indicated by different colors.